AT&T Inc. provides telecommunications services to consumers and businesses in the United States and internationally. AT&T Inc. is a major component of the S&P 500 and Dow Industrials indexes. The company is also a dividend achiever. AT&T Inc. has been consistently increasing its dividends for 25 consecutive years. 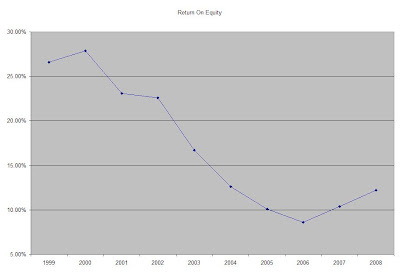 From the end of 1998 up until December 2008 this dividend growth stock has delivered a negative annual average total return of 2.40% to its shareholders. At the same time company has managed to deliver a very modest 1.40% average annual increase in its EPS since 1999. Analysts are expecting T to earn $2/share in 2009 and $2.26 in 2010. AT&T also provides adjusted EPS from continuing operations, which exclude certain non-cash merger related costs of $0.49/share in 2008 (versus $0.73/share in 2007), Workforce reduction of $0.11/share and Merger Related trust investment losses of $0.05/share. If we sum all that up, AT&T’s EPS rises to $2.81. For the purposes of my analysis however, I used EPS from continuing operations. The company has recently announced plans to eliminate 9000 job positions. It announced a 12000 cut in payrolls in December and create 3000 new jobs in March. Furthermore it expects to spend couple billions dollars less on capital spending in 2009. The ROE has fallen from a high of over 27% in 1999 to 12.20% in 2008. Annual dividend payments have increased by an average of 5.70% annually since 1999, which is much higher than the growth in EPS. Given the slow growth in earnings per share and a slowdown of share buybacks I doubt that future dividend increases could be sustained at that level. The dividend costed AT&T $9.5 billion in 2008, which took over 70% of the company’s free cash flow of $13.3 billion for the year. There have been several bullish articles on the stock, which portray AT&T as a safe vessel to ride out the economic storm. As a contrarian I view these as a sell signal or hold at best. Nevertheless a 6 % growth in dividends translates into the dividend payment doubling almost every twelve years. Since 1984 AT&T Inc. has indeed managed to double its dividend payment almost every twelve years on average. The dividend payout has ranged between 43% and 91% over the past decade. Currently the payout ratio is at 74%, which is very high. A lower payout is always a plus, since it leaves room for consistent dividend growth minimizing the impact of short-term fluctuations in earnings. The slow growth in earnings could put future dividend increases at risk. AT&T is well positioned in the wireless segment, as it always tends to unveil new and appealing phones to its subscriber base. The company is working its way in cutting costs through job reductions and realizing synergies from its mergers with the old AT&T and BellSouth. Furthermore the company is expecting to spend 18 billion on capex in 2009 versus 20 billion in 2008. Most recently the company announced after its earnings that it had no plans for significant buybacks in 2009. The company has the cash to pay the dividend at the moment. Since telecoms in general need a lot of cash to sustain their networks, the credit crunch could affect the payment down the road. AT&T Inc. is currently attractively valued. The stock trades at a price/earnings multiple of 10.70 and an above average dividend yield of 7.10%. The high dividend payout worries me at the moment and indicates a danger to its sustainability in the current environment or a further slowdown in dividend growth at best. Despite the fact that AT&T has the cash flows to sustain its current dividend, the above average dividend yield indicates that investors have concerns over the sustainability of the current dividend payment. Thus I believe AT&T is a hold at current prices.